I didn’t believe a word of the 400 pages of Vixen. It had seemed promising – a novel set in 1920s Chicago, the days of Gangsters and Al Capone, Prohibition, Speak Easys and all that Jazz. And the Flapper. All very different and colourful. But the plot simply does not deliver; it meanders aimlessly, lacking incident, propelled by pasteboard characters. Late teenage Clara comes originally from rural Pennsylvania, but has a Past in New York City; what happened there catches up with her slowly throughout the book. She has been exiled to polite suburban Chicago for a spot of rehab with her wealthy Aunt Bea and Cousin Gloria. Put a foot wrong, and she’ll be despatched to the Illinois Girls’ School of Reform. For Aunt Bea, money and status are everything. Private School senior Gloria is already engaged to socialite businessman Bastian – a marriage arranged because each family needs the other’s cash which neither actually has. 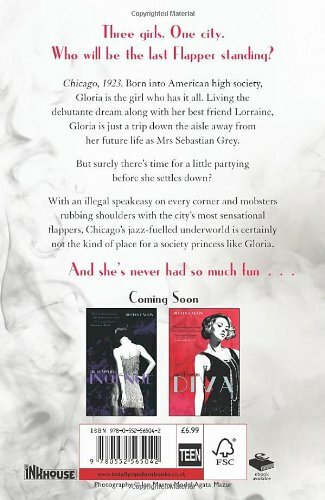 What is more, Gloria is daringly discovering her rebel self. Forget Bastian – she’d rather sneak out from the family mansion and head downtown to The Green Mill Speak Easy, where she finds herself magnetised towards black piano player Jerome. To join the Green Mill set, she needs to become a Flapper, with all the outward and visible signs, the bobbed hair, the latest fashions and the flattest of chests. What you don’t get is a convincing sense of time and place. Obvious, easily researched references punctuate the text, suggesting a sub-Gatsby world; but I never felt immersed in a way of thinking, speaking or acting in a time which, after all, is almost a hundred years away. What the girls want, above everything, is to fulfil the dream of Flapperdom. But why? It’s all so shallow, so fleeting, and if that’s what it was like, and that’s what they want, why should we readers give a damn? The platitudinous men – good, bad or featureless – ‘love’ these girls for no reason except we’re told they do. As in most teen chick lit, a kiss is the height of sexual experience, so things fall well short of believability. Characters share much the same voice, so they remain ciphers. It is all too much about surfaces. The writing is formulaic with a calculating eye on the market, rather than driven by a story that needs telling. At least two more ‘Flappers’ are threatened and the series will probably sell very well. It may be mindless and undemanding, but it will be skilfully packaged much like the ‘Fallen’ series, which comes from the same stable. The first chapter of the next in the sequence is included as a taster at the end of the book. No doubt, there will be a fan-friendly website. The soap opera pleasure of two-dimensional, self-dramatising characters makes for easy reading. As the novelist Peter Dickinson observed long ago, everyone needs literary roughage – we always have and always will. But there’s good roughage and rubbish roughage; young readers deserve better than this.